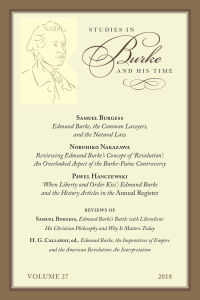 Welcome to Studies in Burke and His Time, the journal of the Edmund Burke Society of America. Our journal editors are Elizabeth Lambert and Michael Brown, and the executive editor is Ian Crowe. Ian Crowe: iancrowe@bac.edu or Belmont Abbey College, 100 Belmont-Mt Holly Road, Belmont, NC 28012. JAMES MATTHEW WILSON, Is Burke Conservatism’s Intellectual Father?